Pens Playoff Problems, What’s the Resolution? PITTSBURGH-As the Pittsburgh Penguins stride into the playoffs, let’s be realistic about their chances. 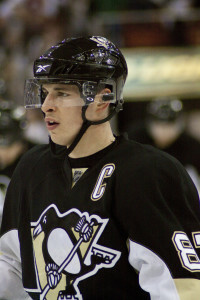 They have no shot to come close to a Stanley Cup unless Sidney Crosby shows up on Dan Bylsma’s lineup card. Even supposing Sid the Kid returns at some point in the playoffs, all measures will be taken to shut down Crosby by the Pens playoff opponent. As much as Evgeni Malkin’splay has underachieved this year and last, he is always a threat. 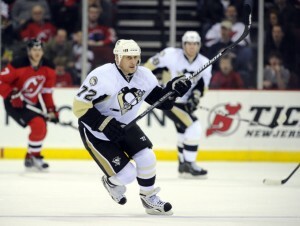 Teams still have to recognize that Malkin, one of the most gifted players in the world, could break out at any moment. Malkin necessitates a certain amount of attention that would normally be split between him and Crosby if they were both dressing in the playoffs. Since Malkin will not be lacing up his skates until next season, all attention will be universally focused on Crosby if and when Crosby returns in the playoffs. Up to this point, the Pens have had an unbelievable season, and even if they lose all of their remaining games, their injury plagued season will still be respected by the rest of the hockey community. Although they’ve had a great season, people need to quit being naive and assuming that the Pens will automatically win a 1st round match-up against the Tampa Bay Lightning. The Lightning have much more offensive talent than the Pens current roster. On paper, the Lightning’s offense could marginally match up against any offensive unit in the NHL with players like Steven Stamkos, Martin St. Louis, Vincent Lecavalier and Simon Gagne. Stamkos and St. Louis are two of the most talented forces in the league. There is constant talk and emphasis that the playoffs are about defense. The Pens definitely have a more experienced defensive core compared to Tampa Bay heading into the playoffs. The Lightning’s defense is pretty weak, and they have actually surrendered more goals than they have scored this season. Despite the Lightning having an over-the-hill starting goaltender in Dwayne Roloson, and as essential as defense can be in the post-season, the Pens have more problems than solutions heading into the playoffs. They aren’t going to have the luxury of a shootout. It doesn’t take a genius to figure out that the Penguins cannot score goals. They’ve registered five goals in their last five games. Take away the services of Crosby and James Neal, and the Pens have one player, Chris Kunitz, who has scored over 20 goals. Neal got the majority of his goals with the Dallas Stars, and Crosby still leads the Pens in scoring by 10 goals despite not playing since the beginning of January. No one knows who is going to be the scoring source for the Pens going forward. Lighting the lamp is more challenging in the playoffs than in the regular season. Playoff hockey is faster, tighter checking and more defensive-minded. The Pens need a forward to get hot and start pouring in goals come playoff time. The most effective way to score goals in the playoffs is on the power play. Right now, the Pens faithful should be lobbying to the NHL to let the Pens decline their power plays. There is no cohesion on the Pens power play unit. Not one player knows what to do, or where to go with the puck. Alex Kovalev won’t shoot, Kris Letang can’t hit the net when he does shoot, and no one else seems to be the answer. The Pens went 0-5 on the power play against the Lightning Thursday night. The Pens man advantage is now 3 for its last 64 after the game against Tampa Bay. For those people who don’t have their calculator handy, that is a whopping 5%, and that’s rounding up. That is also three PP goals in their last 19 games. The Pens register most of their goals at even strength. Occasionally, there won’t be any 5-on-5 scoring opportunities for either team in a tight-checking playoff contest. Since the absence of Crosby, the Pens have been scoring one less goal per game than they did with him in the lineup. The scoring difficulties may be related to a number of things. The injuries to Crosby and Malkin may be the most obvious reasons. However, even if all 4th liners were on the power play, it still should not be 5%. The power play is the culprit for the Pens scoring woes. Since the Penguins score the majority of their goals at even strength, one would think they would want to play 5-on-5 as much as possible. However, the Penguins are the most penalized team in the league. If the Pens continue to give opposing teams power play opportunities, they are going to get burned for it in the playoffs. The Pens continue to take ill-advised penalties at a rapid pace. There has been no improvement in their discipline since the start of this season. For example, the Pens had all of the momentum on their side when Kovalev, a 20-year NHL veteran, took a retaliatory cross-checking penalty with a little less than five minutes to go in the 3rd period against Tampa Bay Thursday night. This put a halt on the Pens comeback attempt. Likewise, the comeback may have been immobilized when the buzzer rang at the end of the 2nd period. The Penguins used to be one of the most intriguing hockey teams to watch due to their comeback ability. Over the previous three seasons, the Pens relentlessly found a way to make comeback after comeback no matter what the circumstances. No lead was ever safe. Fans would never leave a game early if the Pens were down 3-0 heading into the 3rd period. This season, there doesn’t seem to be any explanation as to why the Pens are 0-19-1 when trailing after two periods. Additionally, the Pens are 0-7 at home against the top three teams in the Eastern Conference. Even if the Pens beat the Lightning, something drastic will need to take place if they are going to make a run past the 1st round of the playoffs. The Pens are going to have to overcome the adversity of not being able to come back in the 3rd period. The upgrade that the Pens will need to travel deep into the post-season may be the return of their captain, but teams will do anything and everything to eliminate Crosby. Marc-Andre Fleury has had so much weight put on his shoulders up to this point in the season that one can only wonder whether he’ll have anymore magic left in the playoffs. The Penguins and their coaching staff certainly deserve recognition for what they have accomplished in the 2010-2011 season. Their team defense has made a drastic improvement from a year ago. Although the Pens do have a massive amount of playoff experience heading into the Stanley Cup Playoffs, many people assume that because they are the Pittsburgh Penguins that they will automatically find a way to win, and that the hockey gods will work in their favor. The Pens are a resilient bunch, but they have quite a few holes in their armor right now, and scoring is their largest hole. The Pens have never had a scoring issue to deal with in the past. Someone on the Pens roster needs to make their presence felt and score more goals in the playoffs than anyone would ever believe to be possible. This will more than likely have to be the case despite the return of Crosby. There is no doubt that Sid the Kid’s return will boost everyone’s spirits, but let’s just hope his comeback will boost the team’s goal scoring ability as well.